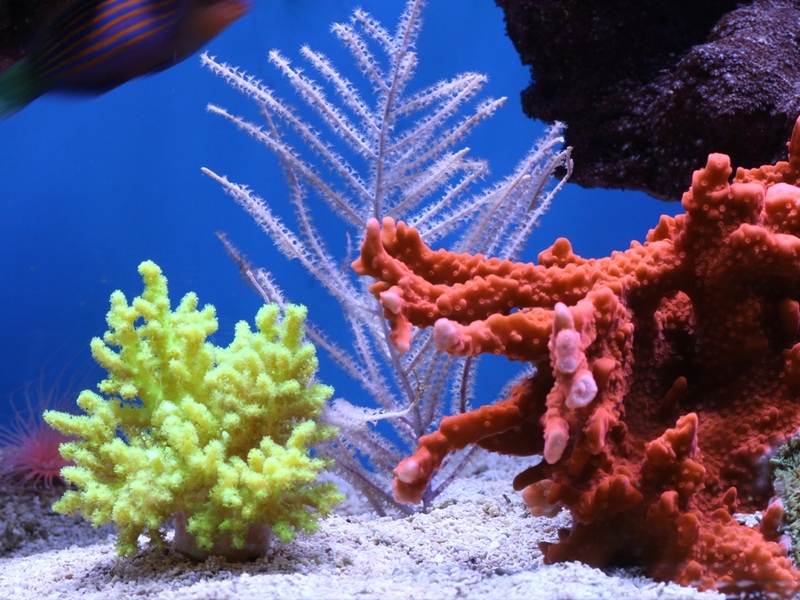 In 1996 I purchased my first saltwater tank from Jack’s Aquarium & Pets. It was a 90g Fish Only system with a wet/dry biological filter. I took it down due to a move in 2002. 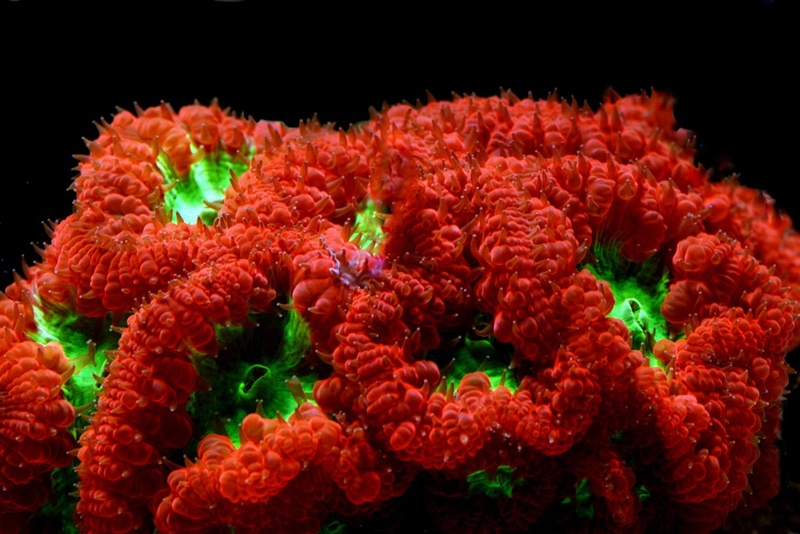 After a two year break it was brought back online in 2004; this time with live rock and soft coral. 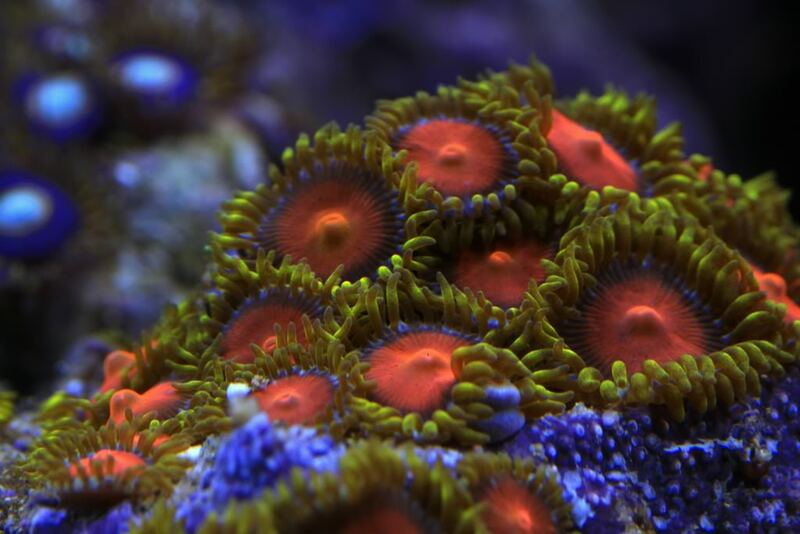 It wasn’t until I found our Local Club, Western Ohio Reef in 2006 that I really became passionate about the Hobby. Sharing the experience with other folks local to me drove the excitement. 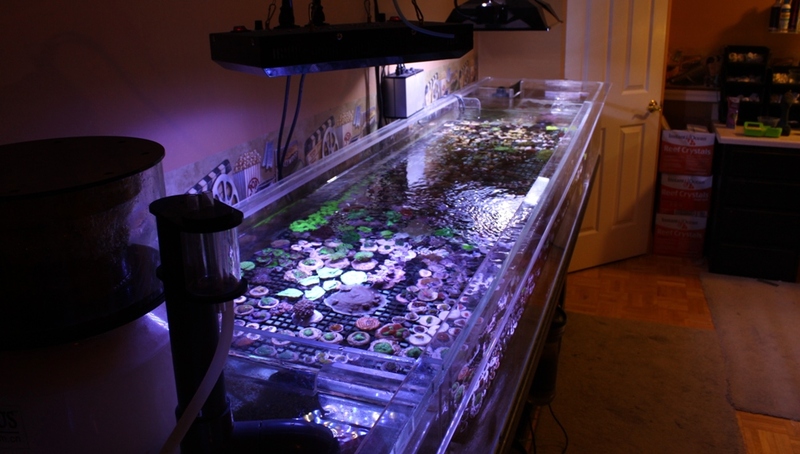 The summer of 2010 I upgraded and moved the sump and equipment to the basement. The Display Tank is 125g drilled with a 1.5” straight pipe and strainer for the overflow with a secondary 1” pipe. Just a few years back there wasn’t as many options as today to minimize the in tank foot print of an overflow. You either got a super large stock corner overflows or a U-Tube. 2x Metal Halide Lumatek Select A-Watt Ballasts, Lumen Bright Reflectors with Artemis 400w 20k bulbs. This setup has done well for me. 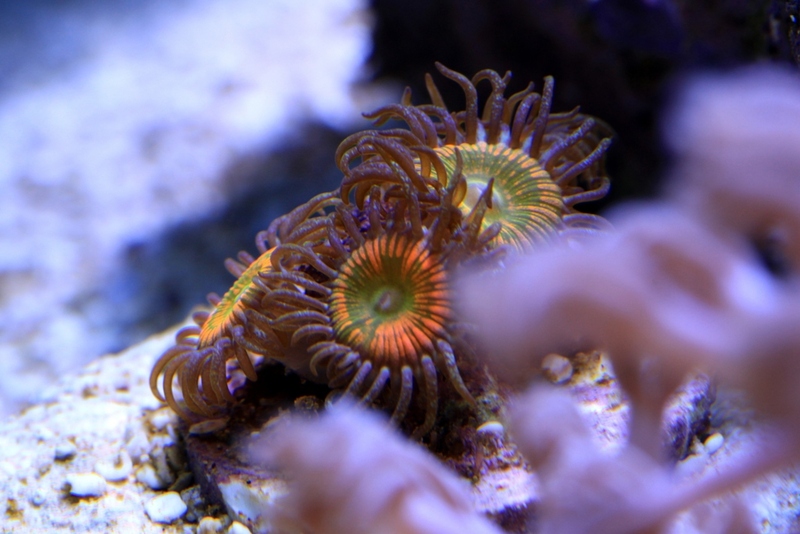 I like that I can dim them to 250w if need be and have done that occasionally when something is amiss in the tank to reduce stress on corals. Recently installed an MS120w LED to add light to the center of the tank. The lights are mounted on a rail to slide out of the way when doing tank maintenance. 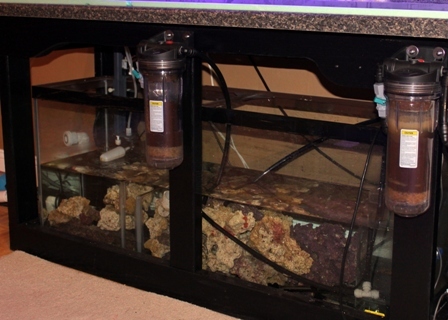 Protein skimmer is a Reef Octopus 250 with a bubble blaster 5000. It has a tendency to overflow at times dumping the entire contents of the skimmer cup back in the tank. Recently moved it to a new location that is more accessible. Hopefully I will empty the cup more often and reduce the amount of skimmate it dumps back in the tank when overflowing. 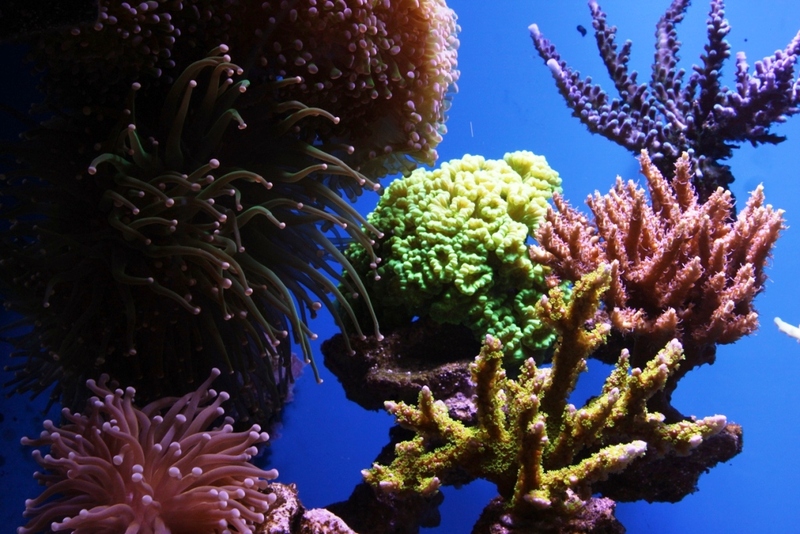 Biological Filtration consists of approximately 100# of Fiji Live Rock and a 1" sand bed. Circulation is a pair of WP40’s, one mounted on each side panel of the tank. Aqua Controller is an Apex by Neptune. I also use a DJ switch for items that run 24x7. This allows me to turn off items for maintenance such as Skimmer and circulation pumps and not have to use a costly Apex port. With a large system and ½ of it in a cool basement it takes significant amount of heat to keep it up to temp. 3 heaters are installed, 500w and 2 300w. They turn on at 78F and off at 78.5. Both are controlled by the Apex and the 500w has a secondary Ranco controller for fail safe. They run a good portion of the day and throughout the night. For cooling an 8” fan is in the canopy of the display which turns on at 78.9F. 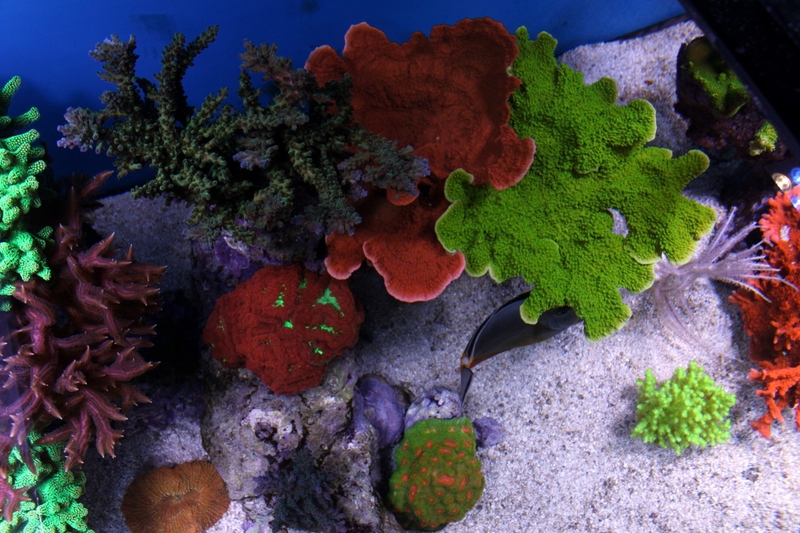 Sump is a 55g tank that receives its water from Refugium. It contains an Auto Top off, Heaters, Probes, Carbon and GFO, additional Live Rock and Iwaki PCX40 Pump returning water back to the display tank. I keep a backup pump on standy in case it goes bad. 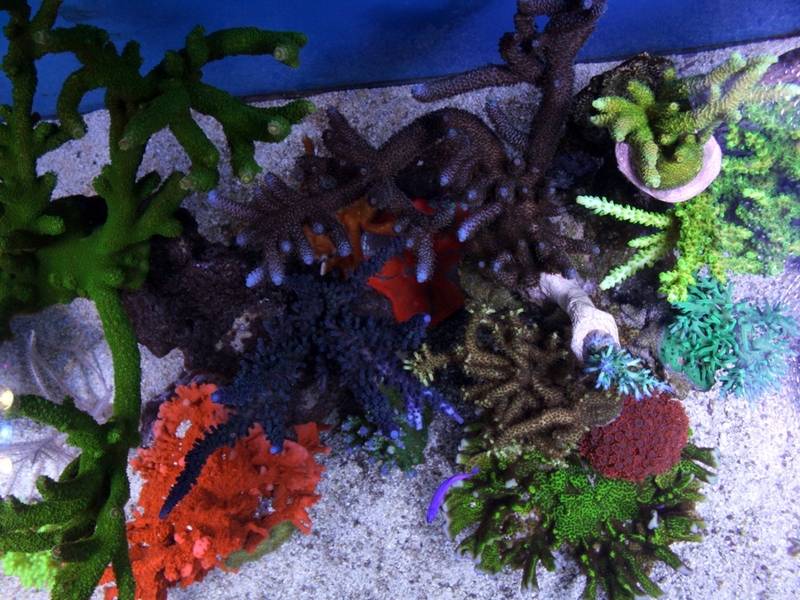 Refugium & Coral Propagation Tank is a custom (150g) 120” Long x 22” Wide x 13” Tall acrylic tank. It is a shared space with several chambers. 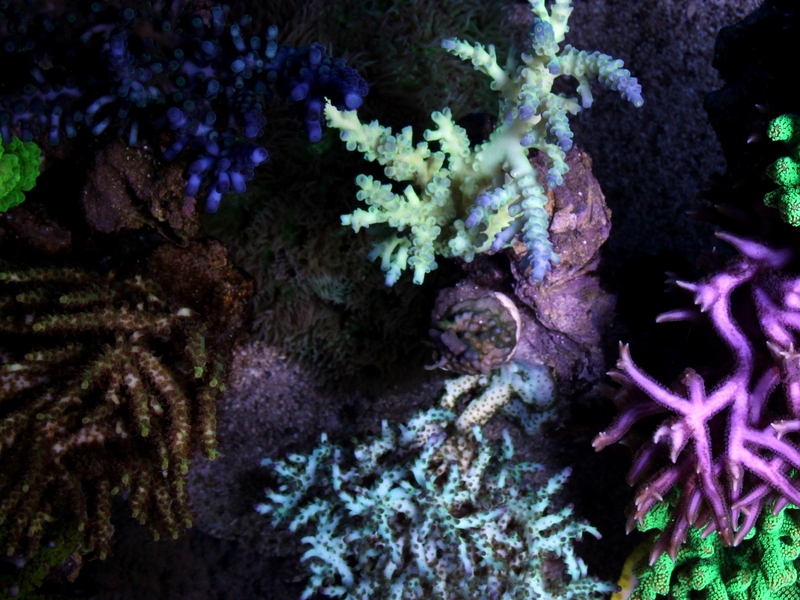 Left chamber is incoming water from display tank and holds the Skimmer, followed by a large center chamber with coral propagation racks and last chamber will be a Refugium with various types of macro algae, deep sand bed and low Kelvin lighting. (Future enhancement). I use Reef Crystals by Instant Ocean Salt. 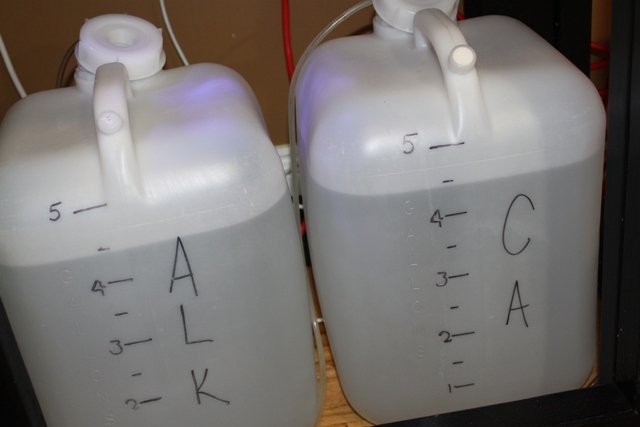 It is a reasonable cost and mixes CA/ALK to the levels the tank is kept. 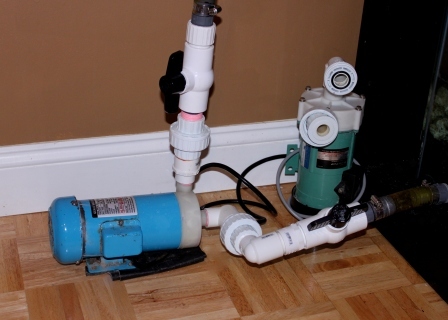 To do a water change there is a bulk head with a ball valve that allows me to remove water by connecting it to a drain in the basement using a length of vinyl hose. To the right of the raceway in a small closet where the house Sump Pump is located there is a Saltwater mixing barrel. 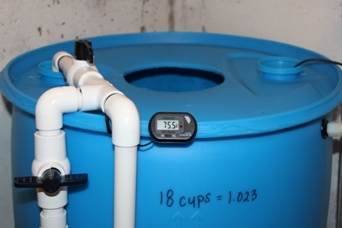 It is 55g drum with a Mag Pump plumbed in to circulate the water. 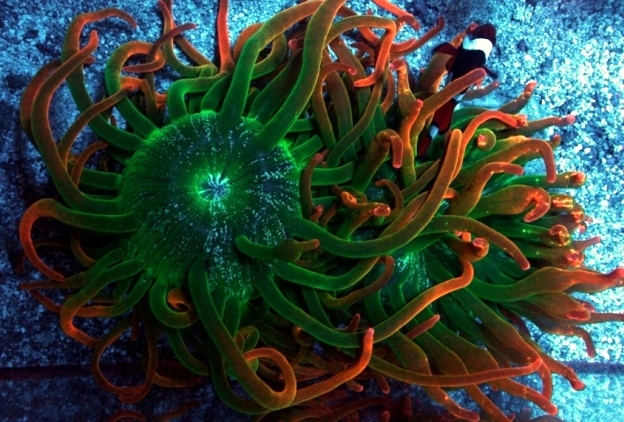 It has 15 feet of 1.5" clear vinyl tubing used to replace the water during a water change. Salinity is maintained via Level Loc Auto Top. I really love this unit. If I have a favorite piece of equipment; this is it. 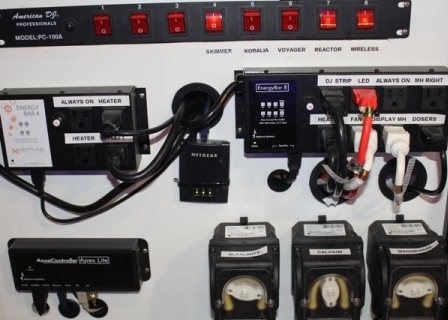 It is connected directly to the RO/DI unit. I like not having to have a holding tank for RO/DI water. 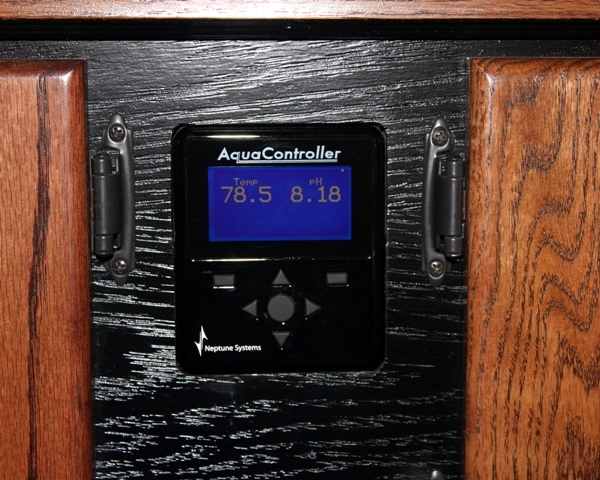 It turns on several times a day to top of sump keeping salinity consistent. 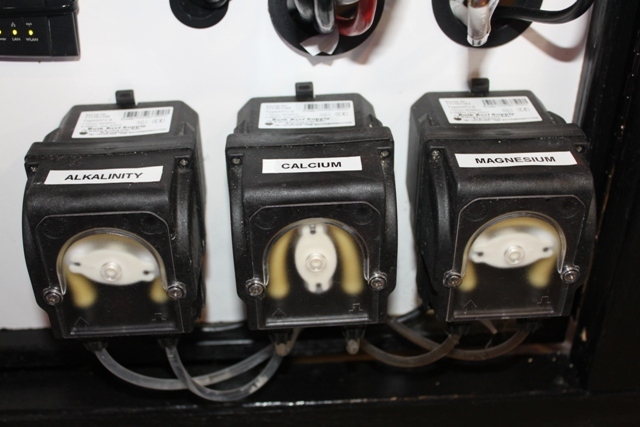 Ca, Alk & Mag is maintained via BRS dosing pumps connected to 5g jugs of the liquid additives. The dosing schedule is handled by the apex hourly. As a safety measure Paul (Wall_Tank) built a custom fail safe that I am very grateful for. It has an internal clock that will shut off dosing if it is running longer then a preset time. This safety measure is in case I manually turn on dosing and forget to turn off or if the Apex outlet sticks. 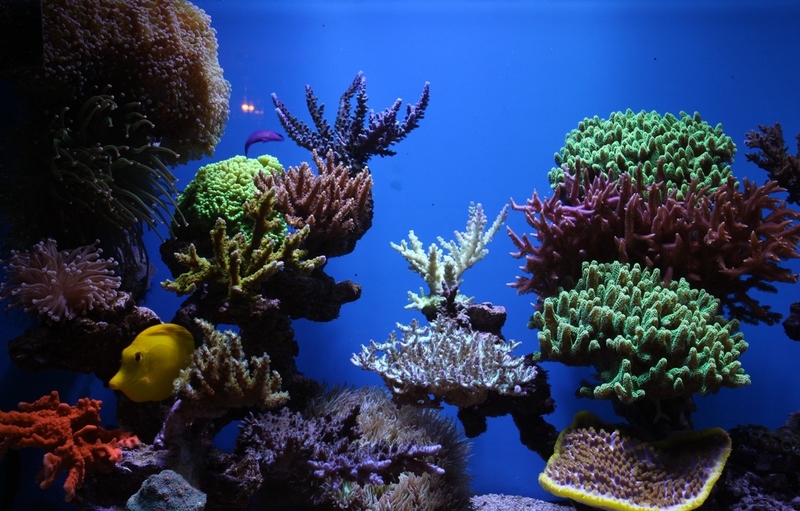 Phosphates are something this tank has always struggled with. My goal is .02. I try to maintain as close to that as possible with use of GFO; most of the time it is running around .05 or greater. 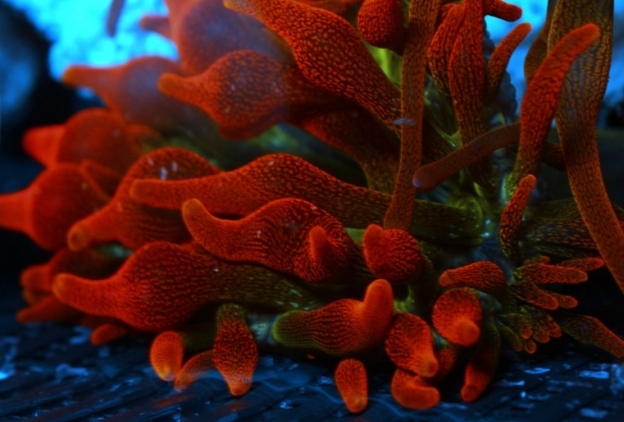 It may be because of the lack of Macro Algae. 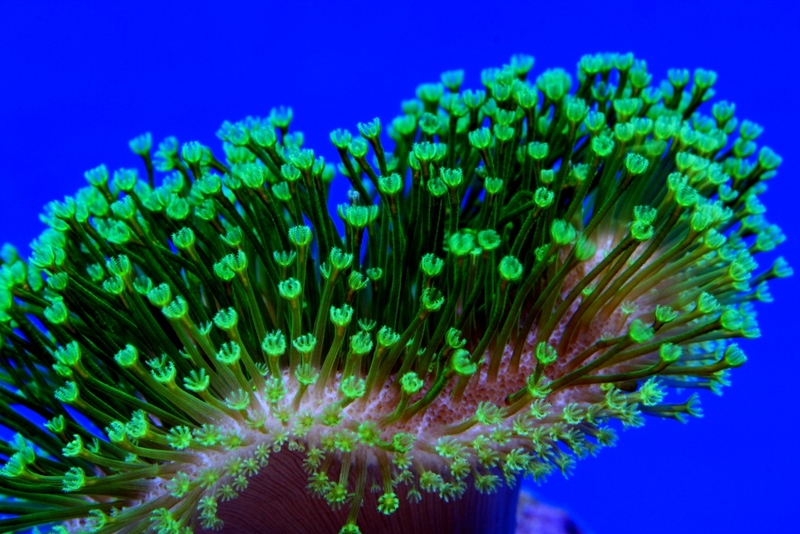 With the latest upgrade there is a place to grow chaetomorpha algae so I hope this becomes a problem of the past and lesson learned. Nitrates have never been an issue and I haven’t done anything specific to control them. Highest they get is around 5. It is a mystery to me why some of us have issues with phosphates and others nitrates. Trace elements, Historically I haven't dosed trace elements. However recently have been experimenting with a bit of potassium. Testing is done via Salifert test kits with exception of Phosphates (Hannah meter). When in maintenance mode I typically test once a month Ca, Alk, Mag. If something is changing in the system that would influence consumption/saturation level then testing is done much more often; daily or weekly. 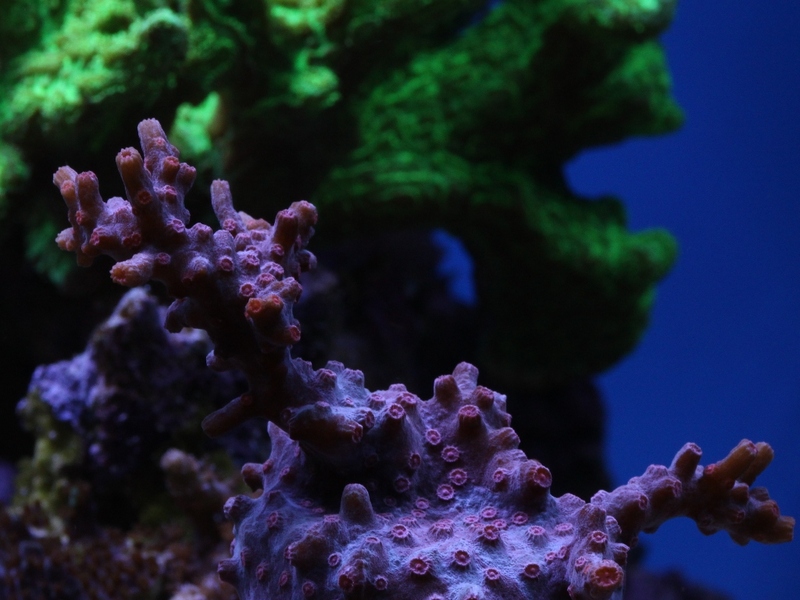 Nitrates checked about every 6 months and don’t test for Ammonia or Nitrite. PH is observed daily from the Apex display. The actual PH of the system is not an important parameter to me but an indicator if it is not where I would expect it to be based on time of day and outside temperature. If it is of concern I test my ALK level. Clean the rear & side glass every other week and front every few days. 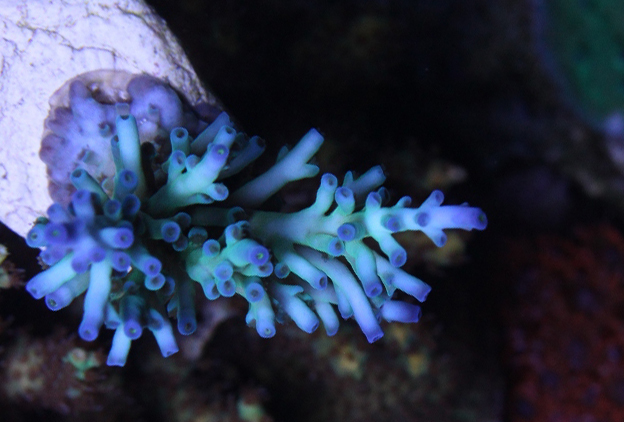 Fill dosing containers monthly, empty and clean skimmer cup weekly. Clean circulation pumps quarterly. 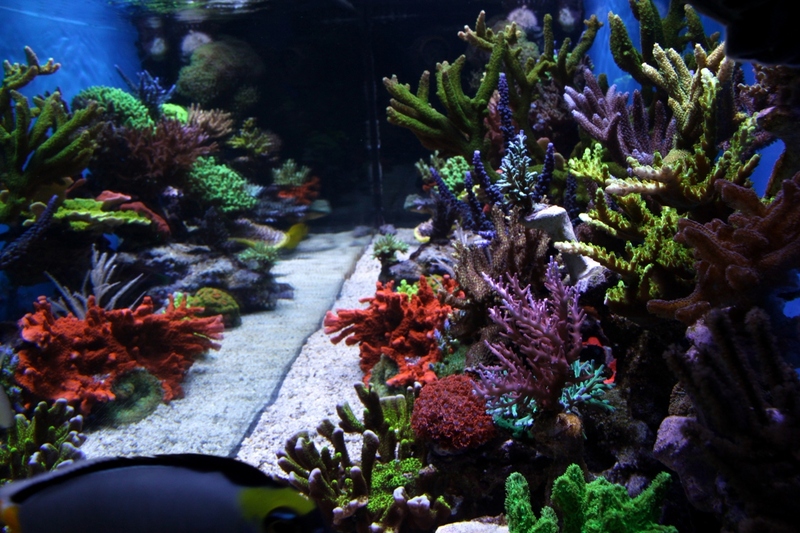 50g water change and vacuum sand about every 2-6 weeks. Replace airline tubing used for dosing pumps semi-annually. Clean MH reflector glass and replace bulbs semi-annually. Blow detritus off of rock annually. 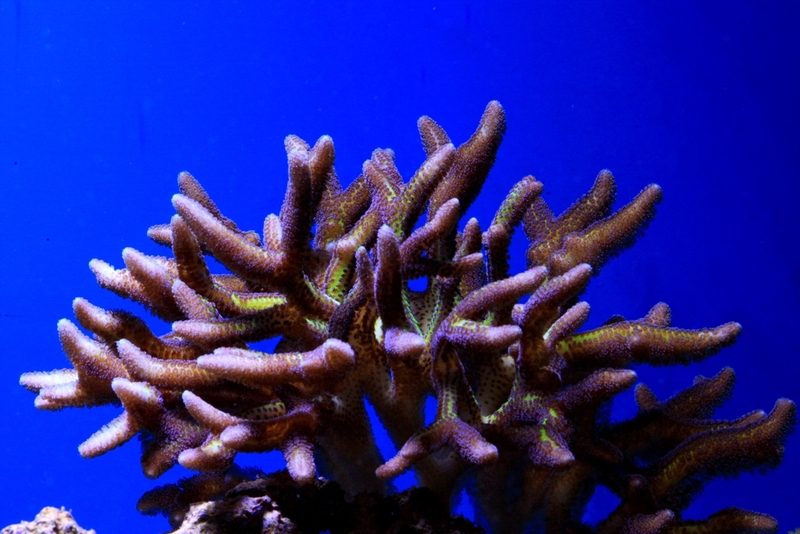 Fish | Inverts : (150g Basement) 2 Yellow Tang, 4 clownfish, Harlequin Tusk and a Chromis | Bubble Tip Anemone’s. 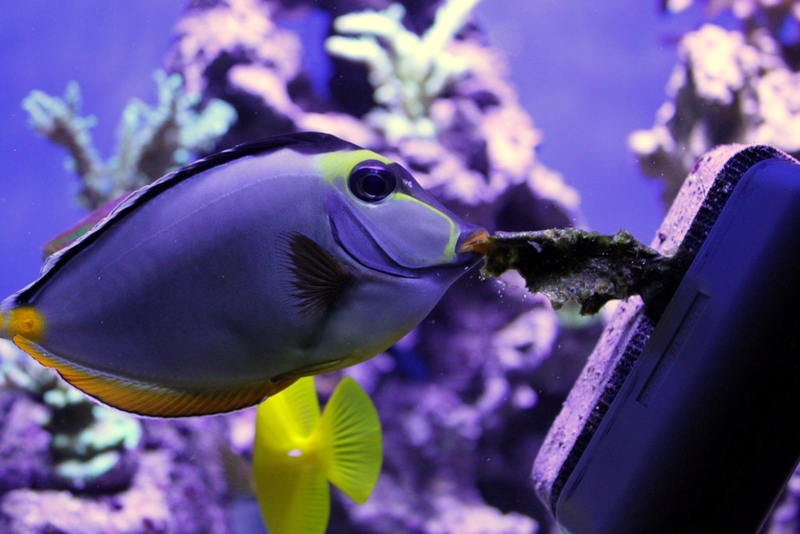 Add live components for the Refugium. 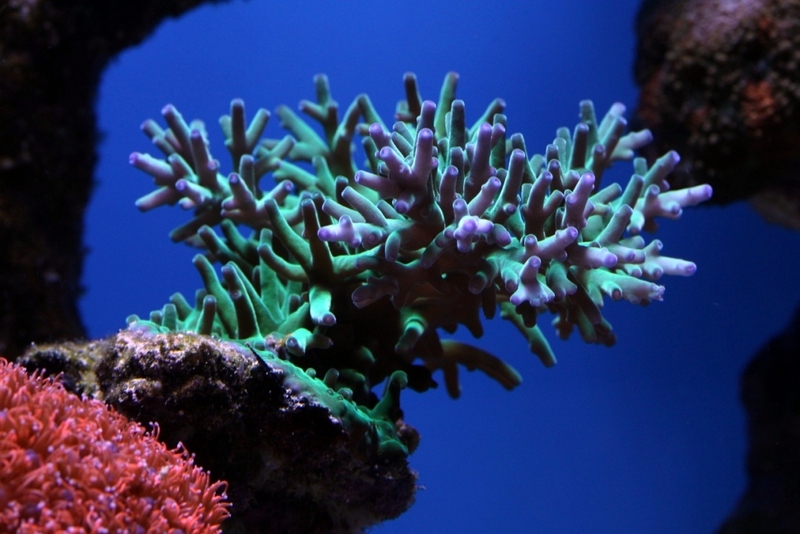 Prior to adding a new coral to your tank, remove it from it's substrate and dip in a white container using Coral RX. If you find pests return it or throw it out. I would like to thank all members of the WORC community for sharing the hobby experience with me every day.